Do you constantly feel anxious? Do you have panic attacks that make you feel as though you are about to lose control? You are not alone. In fact, anxiety disorders are among the most common mental health conditions faced by our society. Perhaps you’ve tried therapy or medication and have not found any real, lasting relief for your symptoms. So where do you go from here? Calming the Rush of Panic will introduce you to the practices of mindfulness-based stress reduction (MBSR)—a proven-effective meditational method developed by Jon Kabat-Zinn—as a way to work through episodes of panic. After an informative introduction to MBSR, you will be guided through a number of exploratory practices and meditations to transform your panic into peace." Each chapter in the book contains informational background on the topic, guided meditations, and up to 10 practices that let you put the information and skills you will learn into action. 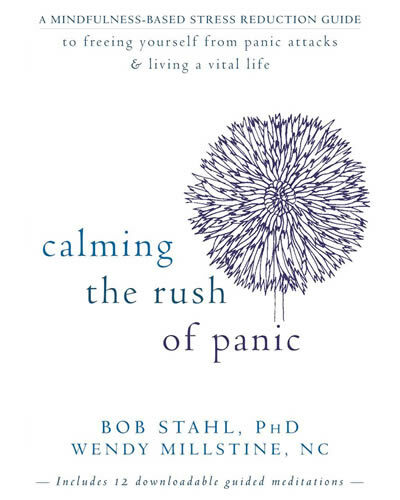 This quick, accessible book is the first to use an MBSR approach to specifically target panic attacks and panic disorder, and its goal is to show you what exists beyond your panic—a life filled with a greater sense of calm, connection, and happiness.